Having applied all of my integrity, intellect and insight to researching the matter, my belief is that we are witnessing right now one of the greatest communications events in history. Indeed, it is arguably the singularly greatest. So, what is this event, and why does it deserves this extraordinary description? The answers are to be found in how the (Western) mass media has been trapped by the most exquisitely constructed double bind. If I am correct (and many share my view), then it portends the imminent collapse of trust in all mass media services and social media platforms. That is because they are implicated in systemic, widespread and longstanding organised crime — that also encompasses much of our political and financial system. If this is unequivocally demonstrated to be so, then the public will unite in disgust at the media’s treacherous betrayal of its journalistic duties. On the other hand, if I/we are wrong, then the power of social media and propaganda to create and inflate bubbles of insanity — trapping intelligent people of goodwill — greatly exceeds anything we dared to imagine. The information age will be darkened by having divided society, destroying a consensus reality. That’s one heck of a story too! For our culture shall inevitably further atomise, as our bonds of shared values and mutual understanding break apart. So too may the constitutional boundaries — and consequent rule of law — that help to keep the peace. I have previously written about the #QAnon phenomenon. My assertion is that Q is a military intelligence team in the Trump administration (itself part of a global positive “Alliance”). They are opening up a backchannel with the public, bypassing the compromised mass media, to reach the “anons” and “autists” who hang out on 8chan. There are good operational reasons for choosing this exotic social media platform. 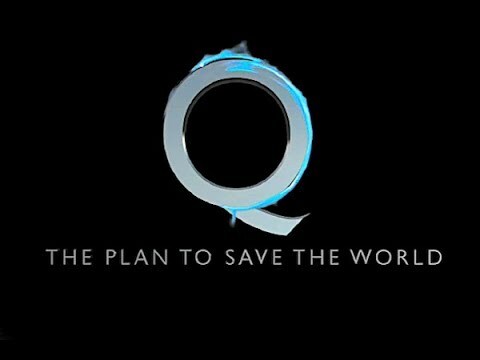 A key purpose of the #QAnon operation is to facilitate a public “Great Awakening”. One of Q’s earliest posts states that “This will be considered the biggest ‘inside’ ‘approved’ dump in American history”. Q is delivering a “soft disclosure” of the end game of a “shadow war” that has been silently raging around us for years. The “drops” expose the present and past crimes and large-scale conspiracies of a transnational negative “Deep State Cabal”. It is a matter bigger than politics itself, since presidents and administrations of both main US parties stand accused of profound corruption and war crimes. So too does the leadership of many supposed allies, including the British establishment. Once full disclosure happens, the Western public’s trust in their governing institutions will be severely shaken. Q is preparing a small slice of the population to share the load of restoring faith in the rule of law in a post-media age. As the American Declaration of Independence asserts, when there is such an iniquitous state of affairs, “it is the Right of the People to alter or to abolish it, and to institute new Government.” We are in the midst of exactly such an event, with worldwide consequences. The present US administration — a de facto military government with a civilian veneer to prevent panic — is engaged in a complete replacement of a “failed and corrupt political establishment”. The process is a patient and judicial one, so as to minimise the risk of violent civil conflict. As I wrote back in November, what is transpiring is a second American Revolution, if not a global “War of Independence” from a psychopathic criminal culture. No thriller or spy novel has ever come close to the tale that is unfolding. You certainly wouldn’t dare to offer this tale as fiction, as it would be deemed far too implausible for public sale! I myself am beyond astounded at what is transpiring, and find myself making unexpected new allies, whilst old acquaintances seek their distance. Many others are having the same stressful experience, as family and friend relationships are strained by vehemently opposing beliefs. Either way, something epic is in progress that affects us all. It will profoundly change how we see each other and the society we live in. For it appears that we have been living under “soft totalitarianism”, complete with a shadow government and power structure, whilst it is falsely sold to us as freedom and democracy. If you want to get away with war-for-profit and mass murder, it is relatively easy if you (surreptitiously) control the mass media. Whilst the media’s role is supposed to be to hold power to account, it has instead become a way for those in power to control the public narrative — in a coordinated fashion. The mass media now manufactures distractions and deceptions, being an agent of a vilely corrupt establishment. Fixing this psychologically abusive system of social control is where Q comes in, with an immaculately designed double-bind. How do you go about undoing decades of manipulation and lies by a media and celebrity class that is compromised to its core? You construct an alternative channel to communicate with the public. Then you work with “volunteer propagandists” of good standing (i.e. people like me) to legitimise and publicise it — denuding the incumbent rival of its power to set the narrative.